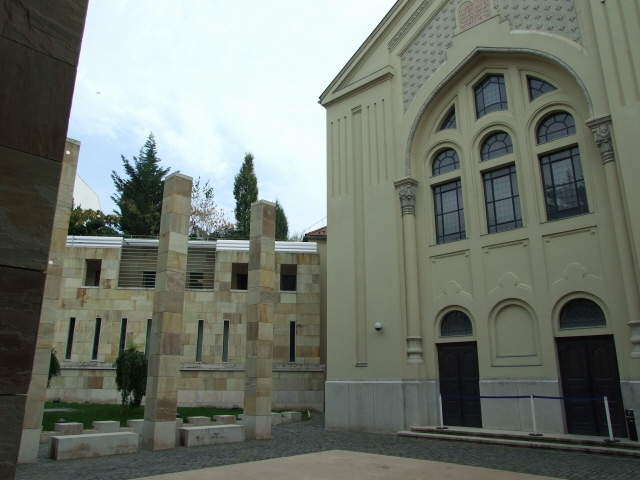 A comparatively recent (opened 2005) memorial site in Budapest comprising of a restored synagogue, a modern outdoor memorial complex and an indoor documentation centre with amuseum exhibition that chronicles the history of anti-Semitism, especially the plight of the Hungarian Jews in the Holocaust and the build-up towards it. More background info: Anti-Semitism and the persecution of the Jews in Europe have a long history, but of course it reached its very worst in the 20th century during the Holocaust. Budapest and other cities in Hungary had thriving Jewish communities. The destruction of Jewish life in the Nazi era esp. during World War II took a somewhat different course in Hungary compared to other Eastern European countries (such as, in particular, Poland – which suffered the worst of it). Herein lies the particular tragedy of the Hungarian Jews: namely that while they too were subjected to discrimination and persecution in the build-up of Nazism in the 1930s , they largely escaped the full-scale genocide that Germany was pursuing elsewhere in 1940s … until as late as 1944. Up to then, the Hungarian government, though officially siding with Germany in the war, resisted full participation in the Holocaust. While the German Nazis’ extermination campaign of "Operation Reinhard" (the most industrially murderous part of the "final solution") was raging in Poland and had already all but eradicated the European Jewry, Hungarian Jews were still comparatively safe. The Hungarian government could point towards Italy where Mussolini, up to then Hitler's closest axis ally, also failed to partake in the full-scale genocide. After Mussolini had been overthrown in Italy that argument no longer held. In March 1944 Hitler lost patience with Hungary and invaded the country. The Hungarian Jews were now suddenly in serious danger. And in fact, with much participation and help from Hungarian institutions, large-scale roundups and deportations began. These were overseen by Adolf Eichmann himself who had been sent to Hungary specifically for that purpose. And his murderous zeal was monumental. Thus several hundred thousand Hungarian Jews were sent to the death camps, especially Auschwitz-Birkenau. The speed of the whole operation was unparalleled. Meanwhile at home Hungary's own Nazi Party, the Arrow Cross, had assumed power during 1944 and set off a killing frenzy themselves, frequently and gratuitously shooting any Jews they could find, often taking them to the banks of the River Danube for execution. Thus the bodies would simply be washed away by the river. A special memorial to those events can be found by the Danube a few hundred yards south of the Parliament building. On the other hand, there were also people willing to help Jews – and a few have become rightly famous for this, most notably Swedish diplomat Raoul Wallenberg and Swiss consul Carl Lutz, who, for instance, supplied forged documents for hundreds of Jews so that they could flee Hungary and Nazi persecution. Other people were prepared to hide Jews. Overall, a higher proportion of Jews survived the Holocaust in Hungary than in other Eastern European countries. However, the special tragedy of the Hungarian part of the Holocaust was a) its late onset and b) the unparalleled speed of its implementation. And that at a time when the Nazis were already clearly losing the war and the whole Nazi cause was nearing its defeat. Had things developed just a little faster, or had Stauffenberg's June 1944 assassination attempt on Hitler been successful, then a much greater proportion of Hungary’s Jews might have survived. What there is to see (and hear): First you have to pass through a security gate, as is often the case at such sites, where security is very tight, with airport-like metal detectors and all. 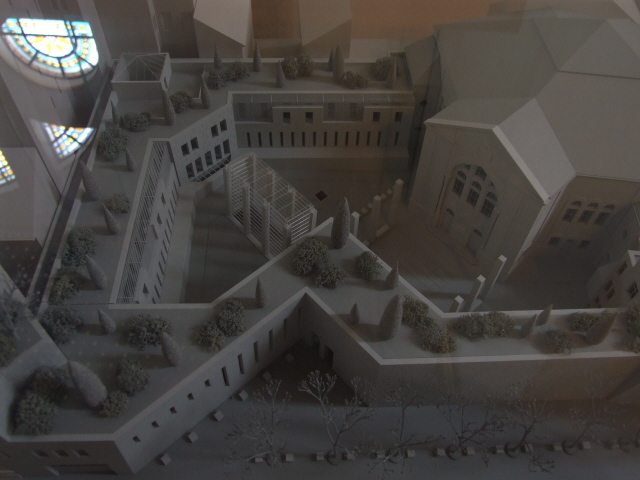 The you get to an asymmetrical courtyard, at the opposite end of which there is the front facade of the restored Pava synagogue. 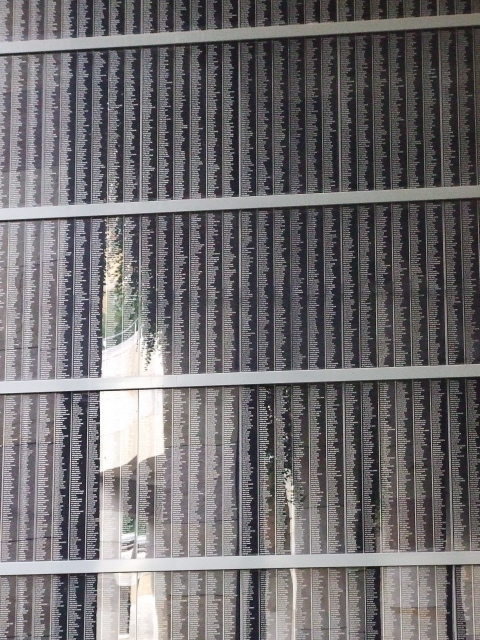 There's a wall of names and several tall square columns. Most striking is the leaning glass entrance to the underground space. The descent down the glass-roofed staircase is obviously highly symbolic – you get similar things at other memorial sites, such as Belzec. Inside you first have to buy your ticket – unlike many other Holocaust memorials it's not free ... despite some references in Budapest tourist brochures claiming that it is. Then a door will be opened for you letting you into the dark exhibition halls. Its full title is "From Deprivation of Rights to Genocide". In fact, the historical sweep of the exhibition is even wider, briefly chronicling earlier developments of anti-Semitism too, which eventually paved the way for the most drastic and murderous expressions of it in the first half of the 20th century. 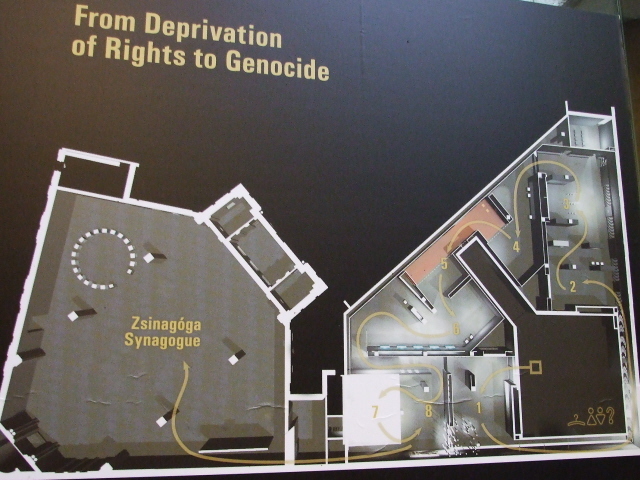 A particular emphasis in the exhibition is naturally placed on the persecution of the Hungarian Jews and their specific place in the history of the Holocaust (see above). Many of these audio points tell personal stories of individuals. A good proportion of the text panels also follow this approach of individualization, clearly a marked element of the overall approach of the museum. Its particular strength, though, is highlighting the special circumstances of the Hungarian part of the Holocaust, which is perhaps less well known than the general history of Nazism and the Holocaust in Germany and Poland. Other parts are likely to be already pretty familiar to foreign visitors who make it to this place. What should perhaps also be mentioned is the fact that at some points in the exhibition you get quite a bit of audio overlap – different audio tracks of film clips, music, the sound coming from the various headphones – and this can be distracting. After a while this audio overlap made it difficult for me to concentrate and keep on reading the text panels. Otherwise, though, the exhibition is very well made indeed. 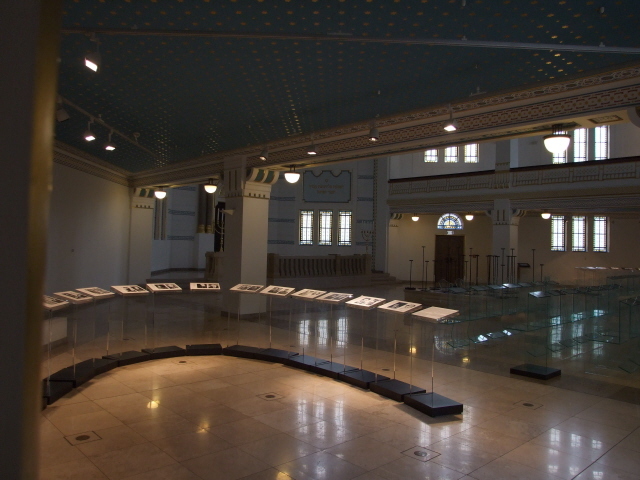 At the end of the exhibition proper you get to the synagogue. There are further temporary exhibitions here too (with text panels not always translated into English here), but the main attraction is the building itself, which has been beautifully restored. 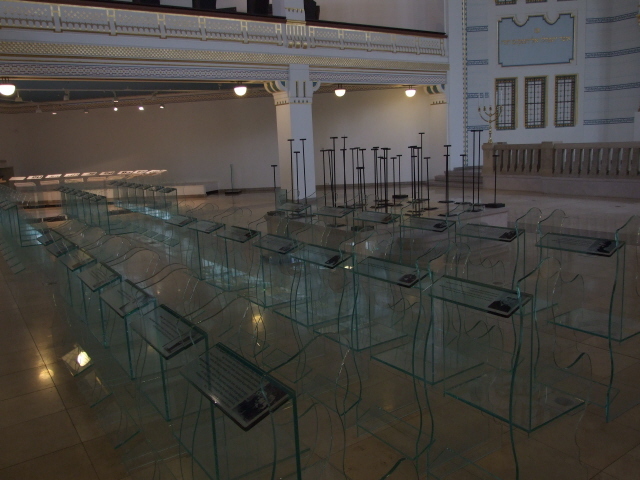 A particularly striking addition to the "normal" interior is a special kind of memorial: rows of chairs made of clear Perspex (not for sitting on! ), each with a little plaque and photo at the top dedicating each chair to an individual who perished in the Holocaust. Thus it makes the disappearance of these individuals "semi-visible" in a very clever and impressive way. Location: in a side street about a mile to the east of the centre of Pest, in the 9th district of Budapest, Hungary. It's on Pava utca, a side street off the Üllöi ut Boulevard heading south-east, three blocks from Ferenc körut square and metro station. Access and costs: fairly easy to get to, a moderate admission fee is charged. Details: A bit hidden and slightly off the main tourist-beaten tracks; the nearest metro station is Ferenc Körut (blue line M3), which is also a stop on the main tram lines 4 and 6 which go along the outer ring. From there it is only a couple of minutes' walk down Üllöi ut. It's also walkable from the centre and its main sights (e.g. 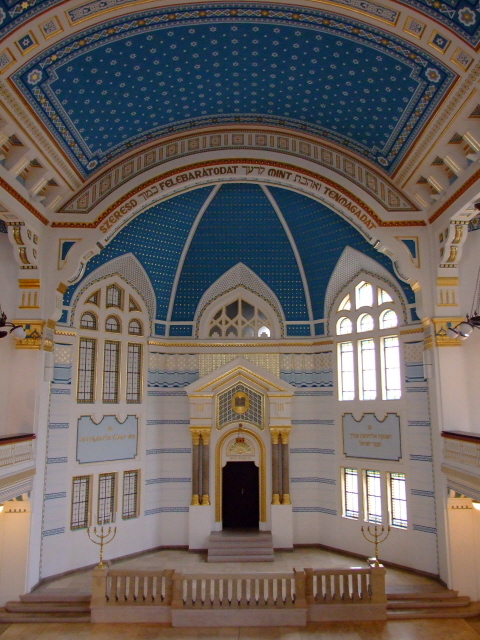 the Great Synagogue). Admission: normal ticket price is 1400 HUF, students (only EEA) and senior citizens (over 62) pay half; free admission only for children under 6 (!?! I wouldn't have thought that this sort of museum is for children at all!) – and for everyone on national holidays. Audio guides can be hired, but I would say they're hardly necessary, as the exhibition is already very audio-heavy as it is. Time required: If you read everything, watch all the video clips, and listen to every single narration on the audio points provided, you can probably spend a whole day here. Most people will prefer to be more selective, though, and you can in fact get a pretty good impression in about two to three hours. Combinations with non-dark destinations: see Budapest. The nearest attraction is the Museum of Applied Art, just a few hundred yards away on Üllöi ut towards the centre. The Great Market Hall at Szabadsdag Bridge and the National Museum aren't so far either.